That’s in theory, but theory doesn’t apply with the Bulls as with three big men injured, Snell Tuesday found himself playing power forward and even center as the Bulls summer league team continued it’s strong play with an 80-78 win over the Portland Trail Blazers. The Bulls remained undefeated heading into second round play as Marquis Teague was again impressive with 25 points and three of three from long range and Andrew Goudelock had just 11 points, but with the two big baskets in overtime to provide the winning margin. Snell had his best game of his three thus far with 14 points, six rebounds, four assists and two steals while defending both power forward Thomas Robinson and center Meyers Leonard. Haven’t the Bulls heard this one before? Malcolm Thomas, who set an all time summer league record with 22 rebounds Tuesday, was out with a leg injury. North Carolina forward Deon Thomas went out after the first game Sunday with an ankle sprain. And second round pick Erik Murphy, who continued to shoot well and had 10 points in just under 14 minutes with a pair of threes, didn’t play after halftime with a broken nose. “It was deja vu all over again,” laughed Griffin about a surge of injuries. But in the next man up Tom Thibodeau philosophy, Snell moved inside against the bigger and stronger Trail Blazers interior players and was impressive. Down the stretch in the fourth quarter as Portland made a run from an 11-point deficit to start the quarter, Snell had a strong block out of Robinson for a rebound and then drew a charge on Robinson. Earlier in the game, Snell held off Leonard, the seven footer from Illinois whom Snell badly outplayed and kept away from the basket despite Leonard’s huge size advantage. Plus, as the Bulls were building up a 50-38 halftime lead, Snell ran a nice fast break with Teague for a score, drove all the way from the three point line for a basket, made some strong ball fakes to get loose for shots and dropped a smooth three. Advertised more as a perimeter shooter, the 6-7 Snell has handled the ball on the break and made more plays off the dribble than spotting up for shots. “Just trying to get used to the faster pace,” said the soft spoken Snell. “It’s a new league (for me). Everyone is legit good. So just getting used to running up and down the court and getting used to the offense and defense, the feel of the game. I feel I fit in pretty well. I use my length to help with defense, help my teammates with the offense too because I move around. I’m a good three point shooter. So when they’re driving I’ll be wide open and can hit the shot. The Bulls also got that good pick and pop shooting again from the second rounder, Murphy. Murphy and Thomas are expected back for the next game. 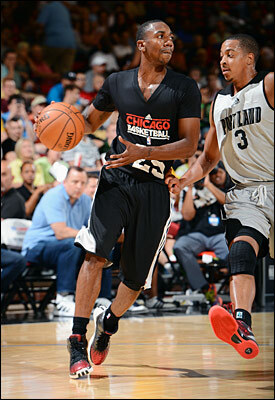 But once again it was second year point guard Marquis Teague who was impressive as he dueled high level rookie C.J. McCollum, who had 27 points and the tying three pointer for force overtime. The Bulls again constantly had the ball in Teague’s hands, especially down the stretch as Teague had a three pointer and a three-point play late in trying to hold off Portland. And having to make plays without inside help, Teague got to the free throw line 12 times and shot seven of 14, most from outside with those three three pointers. The Bulls led 20-15 after the first quarter in keeping up their hot shooting. Snell closed out the first half with a driving three-point play into Portland’s centers for that 12-point lead with some key shooting also from Andy Rautins. The Bulls remained ahead 61-52 after three, though their shooting cooled and then Portland battered them inside with Teague making big shot after big shot to keep Portland from running away with a win. Teague had a shot at a winner and seemed obviously to be fouled on the shot by McCollum. But, hey, it’s Summer League and who doesn’t want to see overtime? Then in overtime, Goudelock, who had been quiet, hit a jumper and a floater and Leonard was too late with a potential forced winner at the buzzer as the Bulls remained undefeated. The Bulls are excited as well in what they are seeing with their first round picks.